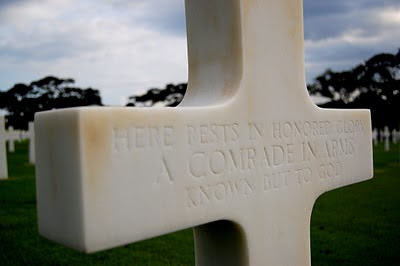 Here rests in honored glory a comrade in arms known but to God. I took this photo several years back when I visited the Manila American Cemetery and Memorial also known as the "Libingan ng mga Bayani". It's Memorial Day in the US and while I'm on the other part of the world, today I'm one with the American people in remembering all who died and fought for democracy and independence. My prayer goes to all of you, I salute you all! Please visit PhotoHunt's HQ to see more interesting MEMORIAL! It may be in a way cheating...but I so want to join Fun Monday and I would really love to share this entry as I believe it is very fitting to tis week's themere. The Church Lady is hosting Fun Monday...you may check what others have! A beautiful take on the theme. It is a tragedy that the person buried there is only known to God. so sad there are so many nameless tombs. Lovely photo and thoughts. Thank you. Excellent take on this weeks theme and and thanks for dropping by my blog and I hope I see you again soon. what a great memorial to honour the departed souls. Very fitting for the theme—and a great pic. So beautiful. And your thoughts are very special too. Thanks and have a wonderful weekend. A very beautiful photograph for the theme Memorial. What a beautiful photo! I love the perspective, and the subject was perfect for this week's theme. I wonder if any PhotoHunters got a photo of the Tomb of the Unknown Soldier. Thanks for visiting my site! i love this photo. excellent shot. Beautiful marble cross and excellent photo. That's a poignant memorial and great shot. Happy Weekend. That is very touching! I think days like our Memorial Day give us all a "kindred" feeling. We are all part of Mankind, right? Sad isn't it? Great photo though. Beautiful photograph....very moving. Thanks for stopping by my blog! It's a lovely photo. I've been to the Libingan ng mga Bayani a few times. What a lovely picture! We have a tomb for unknown soldiers at our national cemetery - one crypt for each war. So far, there are four crypts, but the one for the Vietnam War is empty as the remains were identified and removed for burial "back home". It will remain empty. I'm sure at some point there will be one added for the Iraq War, but may remain empty - identification technology is so good now that I don't know if there will ever be another "Unknown Soldier." What a moving tribute, both the sculpture and the inscription, to the fallen heroes of war. It is good to know that soldiers of all nationalities are remembered in so many different countries. Hope your summer is going well Mariposa and that you and IT Guy are traveling and having fun. Nice one. I haven't been here yet. Have a great week. Thanks so much for sharing this Mariposa! I love the photo. Hope you have a good rest of the week!